Batman Zero Year takes over with Bruce Wayne returning to Gotham after roughly seven years of being presumed dead. After his attempt to remain undetected while returning to Gotham fails thanks to his uncle he is forced into the public eye. However at the same time he is attempting to take down a new street gang led by the Red Hood. The red hood story line is not as great as the court of the owls and death of the family arcs but was still quite entertaining (While providing a possible Joker origin?) after overcoming the Red Hood gang he is propelled into battle with the Riddler. The Riddler is able to in essence hold Gotham hostage for almost a month while the still developing Batman was left incapacitated. In the end however as with all stories Batman is able to out smart the Riddler by finding the simple answer. The city is left in a rebuilding period at the end of volume 5. 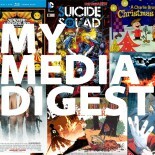 This entry was posted on May 18, 2015 by My Media Digest in Books, Brad Lee, Comics and tagged batman, batman zero year, brad kee, Brad Lee, dc, new, new 52, red hood, riddler, vol 4, vol 5, vol4 zero year, zero year.